Secretariat Redux, Updated Articles, Videos! The images of his glowing copper form streaking past the Belmont Stakes’ finish line, thereby winning the Triple Crown, are forever burnished in our collective minds. I’ve parsed through countless (it seems) clips, articles and websites covering Secretariat. Here is a selection of my favorites. Enjoy! Penny Chenery, owner of Secretariat, sits down with BloodHorse.com‘s Lenny Shulman to share her remembrances of Big Red and his legendary career. “Putting A New Light On The Derby” by Whitney Tower, Sports Illustrated, April 30, 1973 Before the 1973 Kentucky Derby, Whitney Tower scrutinizes the Derby field. “Pure Heart”by William Nack, Sports Illustrated, October 24, 1994. In this SI Classic from 1990, Nack relives the greatest ride of his life: Secretariat’s thrilling career as a racehorse. The Big Red Horse, The Secretariat Story by Lawence Scanlan, For young readers and up. Through his contributions to Thoroughbred racing that resonate to this day, Alfred Gwynne Vanderbilt, 1912-1999, was one of the architects of the golden years of racing spanning the 20th century. The young man who devised the match race of the century between Seabiscuit and War Admiral, and whose homebred Native Dancer influences the pedigrees of Thoroughbreds to this day, became a horseman accepted as a peer by the finicky and fickle population that makes up horse racing. Whereas Vanderbilt had to earn his racing stripes one at a time, outside of the track milieu his own pedigree from a storied American family gave him advantages in terms of access and wealth. A great-great-grandson of transportation and shipping magnate Cornelius “Commodore” Vanderbilt, young Alfred lost his father in 1915 when the Lusitania sank. As an adult, one week might find Vanderbilt sitting outside the Dancer’s stall shooting the breeze with Lester Murray, Dancer’s groom. The next week he might be on safari with Ernest Hemingway. As a teenager, the racing bug sank its bite into Vanderbilt and never let go. At 21, he was given his mother’s racing stable and its horse farm base in Maryland, Sagamore Farm. Racehorses raised at Sagamore include Native Dancer, Find, Bed o’ Roses and the memorably named Social Outcast. Vanderbilt’s cerise and white silks were immediately recognizable out on the track and in the winners’ circle. Those silks were last seen as his homebred filly Opening Address was sent out alone to gallop over the Aqueduct track as part of Vanderbilt’s memorial service in December 1999. Vanderbilt’s involvement in racing went far beyond being an owner-breeder. He had a knack for racecourse management and brought his skills to Pimlico, the Westchester Racing Association − the precursor of the New York Racing Association (NYRA). He was chair of the board and CEO of NYRA for four years. Early on in his racing career, Vanderbilt was dissatisfied with the starting procedures of racing so he developed the starting gate; at the other end of a race, Vanderbilt pioneered the use of a photo-finish camera. In August 1963, Vanderbilt was featured in a Sports Illustrated cover story that outlined his concerns about where racing was headed and what was needed to remedy the situation. The points made in the article concerning industry leadership and uniform standards are as relevant today as they were 52 years ago. One of Vanderbilt’s roles outside of racing was as an advocate for veterans. He served as a lieutenant on a PT boat in the Pacific in World War II, earning a Silver Star for gallantry. After the war, he was the head of the World Veterans’ Fund. How can it be? The Kentucky Derby 2015 is upon us. The preps are done and the scores have been racked up to identify the 20 horses that will explode out of the starting gate next Saturday. But wait, there have been some interlopers this year, taking the focus away from the feeding frenzy of Derby fever. Last year’s Kentucky Derby winner, California Chrome flew over to Dubai in in mid-March to get ready for the globe’s richest race, the Dubai World Cup. He was a closing second as he ran out of track. Chrome is a colossally game colt and deserves the fervor of his fans, the Chromies. Racing under the mantle of Dumbass Partners, Chrome’s owners elected for him to stay abroad after Dubai, sending him to Newmarket in the U.K. to get ready to run on the turf in the Group 1 Prince of Wales’s Stakes at Royal Ascot on June 17. With Chrome’s Kentucky Derby and Preakness wins last year, the two DAP partners got carried away and started believing their own press. It was ugly. Nevertheless, hats off to them for sending Chrome on the road to face the best in the world. What are the odds we will be seeing a Stetson or two among the requisite top hats mandated by the race meet’s dress code? The prospect of the DAP boys at Royal Ascot is a scenario Mark Twain would relish. This year, Chrome’s rival from California, Shared Belief won the San Antonio Invitational Stakes–Grade 2 (where he bested California Chrome), and the Santa Anita Handicap–Grade 1. Passing up Dubai or a run at Royal Ascot, Shared Belief was flown to West Virginia to run in the $1,500,000 Charles Town Classic Stakes–Grade 2 on April 18. Out of the gate, jockey Mike Smith felt something awry with the way Shared Belief was travelling and pulled him up. A nuclear scintigraphy scan revealed a non-displaced fracture of his right hip. Shared Belief was flown back to California and will recuperate at Pegasus Training and Equine Rehabilitation Center in Redmond Washington, one of the finest rehabilitation facilities in the U.S.
With an expected field of 20, it’s hard to tout a horse until the post positions are drawn. A horse that gets a spot close to the rail has a tough trip ahead, that is unless Calvin Borel is in the irons on El Kabeir, then all bets are off. As for the trainers of the Derby horses, they’ve done their jobs and conditioned their horses to a fine pitch. From hereon in, the trick is to keep their horses sound and well through to the finish of the race. Watch any one of those 20 horses, and you’ll see a thousand pounds of muscle and brawn ready to rumble. In an interesting twist, South African trainer Mike De Kock has sent a Dubai-based colt to run for the roses. Mubtaahij will likely be the only horse to run without the benefit of the controversial diuretic Lasix, that is believed to prevent pulmonary hemorrhaging. Talk to five horse racing professionals about Lasix and you’ll get five differing opinions, running the gamut from whining to righteous indignation. Whining, indignation, race day medication? Welcome to America, Mr. De Kock. To deregulate interstate commerce with respect to parimutuel wagering on horseracing, and for other purposes. racing Deregulation Act of 2015’’. order to further the horseracing industry of the 4 United States. the use of, and testing for, performance-enhancing 12 drugs in interstate horseracing. 21 certain trainers compete because they assume illegal 22 drug use affects race results. 25 percent from 2002 to 2014.
not met its original policy goal of furthering the 3 United States horseracing industry. 12 dueled, and lugged in before going wrong and falling after 13 the finish line. (a) IN GENERAL.—The Interstate Horseracing Act 17 of 1978 (Public Law 95–515; 15 U.S.C. 3001 et seq.) is 18 hereby repealed. Hats. Fascinators. Chapeaus. 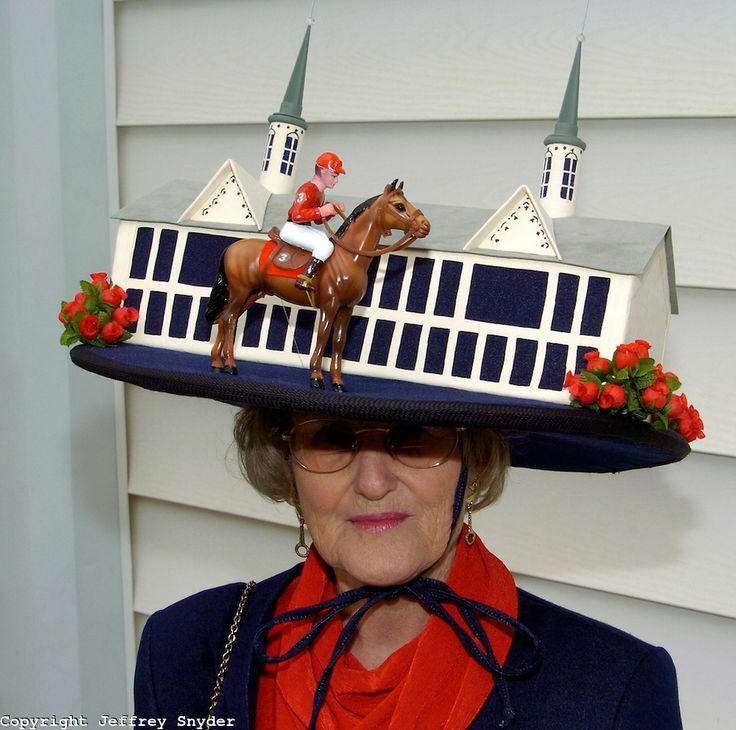 Whatever you call them, women attending the Kentucky Derby plan what hat they will wear almost as much as which horse they will back. If you are going to the Derby or even a Derby party, how often do you get to wear a fabulous hat? Fascinators skyrocketed onto the map after Kate Middleton married Prince William. It seemed that every other woman was wearing a one. Not quite a serious broad rimmed hat and not quite a headband, fascinators broke new ground! The question is “What’s the secret to styling a fascinator look?” Goldplaited, a finishing salon headquartered in Chicago, has been working with clients preparing their Derby looks. The salon’s owners, sisters Mary Alice and Corinna Strong, grew up in the horse-mad Genesee Valley in New York, and have been dressing for race meets since they could walk. The Goldplaited sisters are recommending two fascinator looks, hair up and hair down, for Derby day. On model, Lauren (below), we chose an elegant, side-swept,chignon to show off her stunning color. By pulling the hair to one side, both the style and her charming green hat are on display. Chignon’s are timeless, classy and can truly be effortless. Create your own chignon by gathering your hair into a low side pony. For added texture and detail, consider curling your hair in medium sized sections while it’s in the pony tail.Twist the hair around itself as if you are forming a bun, secure with a bobby pin that closely matches your hair color. Chignons can be shaped and pinned to your desired style. 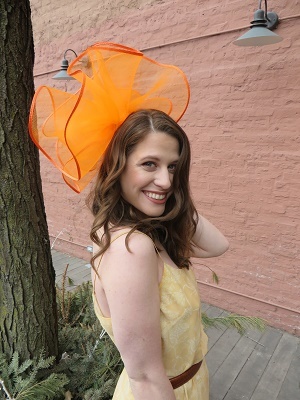 On model, Erin (below), we went for casual waves to perfectly compliment her bold, fun hat. Undone, beachy hair with texture will be the “it-style” for Spring and Summer and lucky for Derby fans, it looks great under a fascinator! To achieve this look, prep your wet hair with mousse for fullness and rough dry it. Add styling creme or texture spray to give your hair a little grit. Use a wand or large barrel curling iron to create the waves, we recommend curling medium to large sections of hair. To prevent flat hair, we recommend curling on the tighter side and letting the curls fall to a looser place over time. Eric Guerin up on two time Horse of the Year Native Dancer. Photo courtesy of NYRA/CoglianeseLast Thursday night, Native Dancer became the first horse inducted into the Maryland State Athletic Hall of Fame. Raised and trained at his owner-breeder Alfred G. Vanderbilt, Jr.’s Sagamore Farm in Glyndon, Maryland, Native Dancer raced for three years, mesmerizing millions of fans both at the track and on newsreels and nascent television broadcasts. Dubbed the Gray Ghost, the physically stunning colt won 21 of 22 races. His only loss was in the Kentucky Derby; he came in second. Going in as favorite, given his undefeated record over a course of nine rigorous races, the Triple Crown was Native Dancer’s to lose. What came between him and the turf’s Holy Grail, was a calamitous trip — from a fraught start to running out of track in his brilliant rally to not quite take down the winner, Dark Star. At the end Native Dancer was going fastest, but the end came a stride too soon. It was Dark Star’s head that caught the camera. Disappointing as the loss was, Native Dancer’s speed and physical beauty ensnared the nation’s psyche to the extent he was on the cover of Time magazine, and, television and theater newsreels broadcast his life both on the racetrack and at Sagamore where he retired to stud. 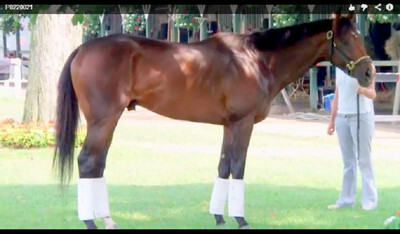 Native Dancer’s sons exert far-reaching influence. It is as a stallion that Native Dancer’s influence on the modern thoroughbred race horse reaches into the furthest corners of pedigrees in champions and claiming horses alike. The Dancer’s immediate offspring acquitted themselves well, among them Kentucky Derby winners Kauai King and Dancer’s Image*, and stakes horses Raise a Native and Native Charger. Freakishly fast but physically fragile, Raise a Native sired the likes of Majestic Prince (Kentucky Derby and Preakness Stakes winner), and Alydar (second in the Kentucky Derby, Preakness Stakes and Belmont Stakes, graded stakes winner). Although they could be ranked at best as respectable race horses, it was Raise a Native’s sons Exclusive Native and Mr. Prospector who truly shone as sires. Mr. Prospector, a sprinter at the track, stood at Claiborne after beginning his career in Florida, and what he brought to the table as a sire — aside from phenomenal, game altering class – was speed that stayed and combined well with the stamina of other lines. Native Dancer’s daughters beget dynasties. 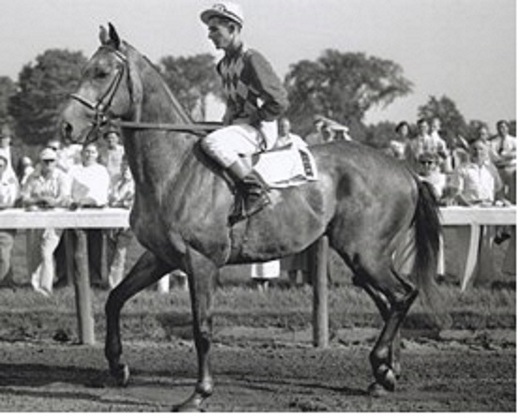 Native Dancer’s daughter Natalma was the dam of Northern Dancer, whose influence on racing is global. Independent of her Northern Dancer connection, Natalma’s daughters’ families are responsible for the likes of the great sire Machiavellian, Prix de l’Arc de Triomphe victor Bago and the overpowering filly La Prevoyante. Another of the Dancer’s daughters, Shenanigans, produced sires Icecapade and Buckfinder, the broodmare Laughter and the brilliant, ill-fated Ruffian. 2013 Kentucky Derby winner Orb is a direct descendant of Shenanigans. Sixty years after the Gray Ghost of Sagamore Farm electrified the nation with his grit and ability, his bloodlines run strong. It’s only fitting that Maryland, a center for thoroughbred sport, has honored one of its own. Kentucky Derby winner Orb at Saratoga. His fifth dam, his great-great-great-grandmother, is Native Dancer’s daughter Shenanigans. Photo courtesy of Liz O’Connell*Dancer’s Image was subsequently disqualified and sent down to last place because of a positive test for a trace of the NSAID phenylbutazone.